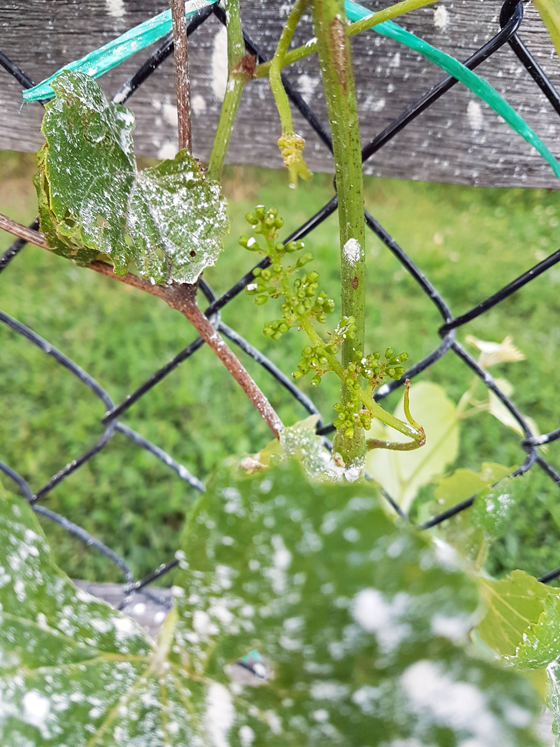 What’s eating all my grapes? In case it’s not clear, I’m pretty much winging it when it comes to our grapevines. So I was thrilled to have the opportunity to talk with Brian Schmidt of Vineland Estates. Brian and the Vineland team have 118 acres of vineyards in Niagara. Way more than our dozen vines. Brian was extremely generous in answering my questions and talking me through how to care for our vines. He gave me a great confidence boost. My main question was whether to pinch off any fruit this year so that the vines can focus on growing big and strong. Brian’s advice was that the key to long-term success is to not overburden the vines in their youth. So these baby grapes will be picked this weekend. Brian also gave me advice on pruning, trellising and pest control. 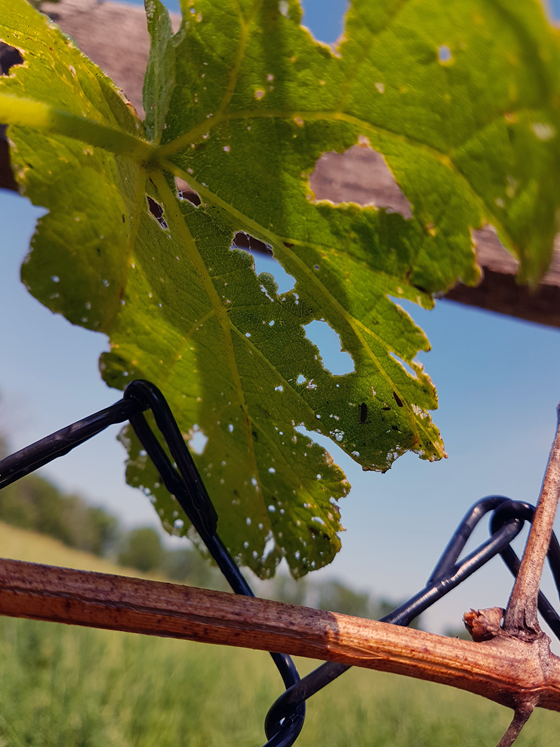 Pests are the one issue that’s arisen with our vines this spring. 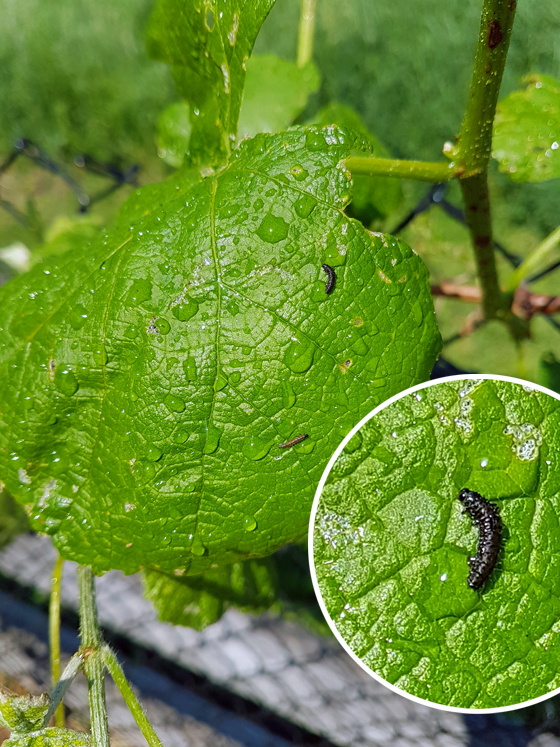 Some little worms are eating the leaves on our second year vines (the ones we planted last spring). The Lakemonts, which are brand new as of a few weeks ago, have too few leaves to be a target yet. 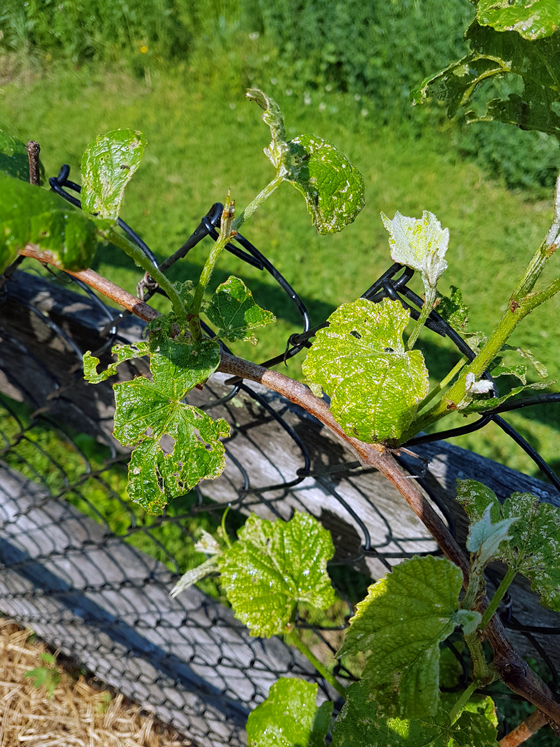 Our leafiest vines have been very hard hit. 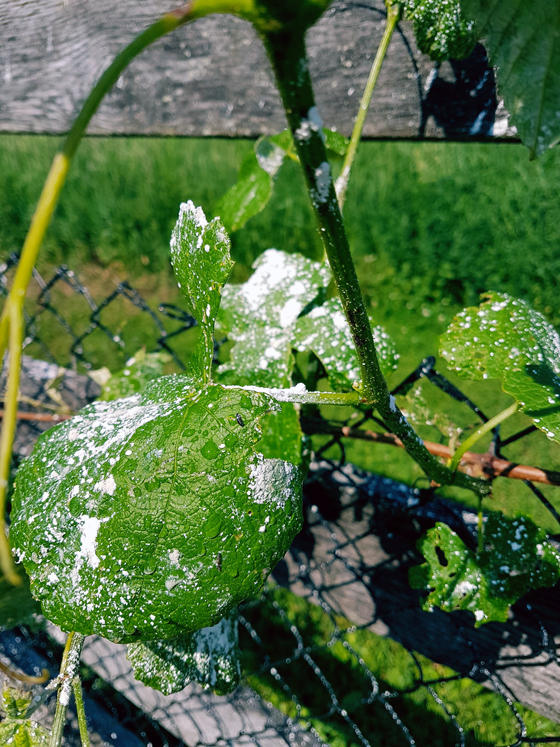 Brian’s advice was to give our vines a case of dandruff. Not really. He was much more professional than that. He suggested diatomaceous earth. I’ve heard of DE before, but didn’t know much about it. DE is a powder made from “the fossilized remains of marine phytoplankton.” Brian described it as “eating glass” for bugs. Lovely image, but sorry bugs. The nice thing about DE is that it’s safe for humans to eat, unlike many chemical pesticides. I sprinkled it all over the vines last weekend. So far, the DE doesn’t seem to be doing the trick. In fact, there are more worms than ever. From the little bit of research I’ve done on DE, it sounds like it might be more for bugs with hard outer shells and more of a topical than an ingestible. The worms are pretty soft-shelled. They’re very easily crushed when I pinch them–which may be the solution I resort to. I’ve given the vines a second dusting of DE, and I’m hoping that this might be enough to stop the infestation. I’d really appreciate any ideas you have. Anyone know what these pests are and how to get rid of them? Should I just be patient with the DE? Could be cankerworm. Hamilton is currently dealing with an infestation of them. Doesn’t seem to be much that can be done, and supposedly the plants will recover. Lots of trees a looking pretty sparse right now. Thanks for the suggestion. I looked up and I’m encouraged that if it is cankerworm the plants recover. Although my vines are so new and so eaten I’m still a bit worried. Our go-to for all bugs here is to mix a bit of dish soap in with water and spray it on the plants. It gets rid of the bugs (poisons them or they don’t like it, I’m not sure which) but it’s safe and non-toxic. Good luck! The worm looks all black. Does it have any yellowish-green stripes? No stripes. They’re either a dull brown (when they’re smaller) or black. I’ve heard of this technique. What ratio do you use with the dish soap? Here is an article with a recipe – probably better than me trying to explain Sharon’s lack of measurements, lol. I have two companions along the side of my facebook now – Baxter and Ralph! 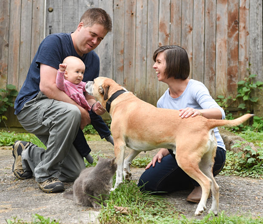 It’s an ad for the article you wrote about introducing dogs and cats. I’m very happy to have them replace the ubiquitous commercials that usually take that spot! 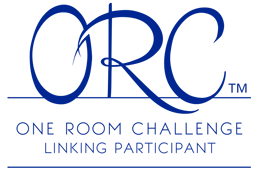 Well it would help if I actually included the link…duh. Thanks, Jan. I appreciate this. The vines actually seem to be looking better. I went through and pinched every single worm I could find. It was pretty gross, but seems to have been effective. I also did a massive prune and cut off a bunch of leaves so the worms have less food. Whether it’s my massacre, my pruning or the DE finally working, I don’t really know, but things are improving. I’ll hold onto this recipe though. I may need it in the future. Apparently all black worms are actually millipedes, and DE is the best thing for them. As well as keeping leaves dry (so if watering, don’t use a sprinkler that gets the leaves wet – use a soaker hose). DE on the leaves and on the ground around the plants to keep the bugs from even getting to the leaves. Jan, I have heard that about dish soap on plants. I may have to try that in the garden. Hopefully you don’t need this.